Orkney single malt Highland Park has completed a two-part series of releases with the launch of Highland Park The Light, a 17-year-old whisky matured in American oak casks. The new expression aims to reflect the spring and summer seasons on Orkney, celebrating ‘a time to emerge from winter hibernation, ready to embrace the warm, bright days of summer’. Highland Park The Light is the second of a two-part series, following last year’s release of Highland Park The Dark, a Sherry cask-matured single malt designed to represent autumn and winter. 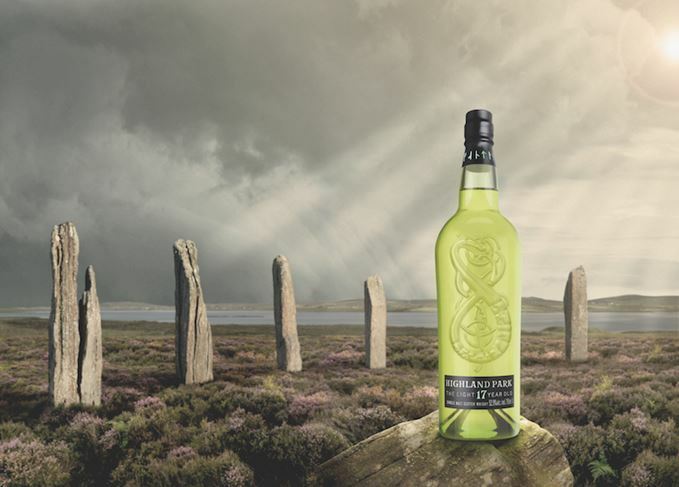 Bottled in pale green glass with a Viking-inspired serpent dragon on the front, Highland Park The Light is said to combine flavours of caramelised pear, nutmeg, vanilla, cedar wood and light peat smoke. ‘In both The Light and The Dark, we share the story of the noble Viking warriors who are our ancestors, of our contrasting island seasons and of the intense balance of our whisky,’ said Jason Craig, Highland Park brand director. As with The Dark, 28,000 bottles of The Light are available, bottled at 52.9% abv, naturally coloured and with a UK recommended selling price of £190 for a 70cl bottle.